I was given a free copy of MER for an honest review. Firstly I must compliment the cover it really is beautiful. The opening scene I must say was very well written you could practically feel the breeze on your face to the waves lapping against the fishing boat. I knew straight away once the men pulled in their enormous catch that this story was going to take me to a place that only existed in bed- time stories. The main character is Quinlan who is only ten years old but she is full of mischief always getting in trouble. She is funny to read and she doesn’t act like a lady brought up in wealth there is no snobbishness about her, she befriends staff of the castle, but in particular a kitchen boy named Noam. On a night of finding a glowing rock her future changes. When her grandfather comes to visit her, she leaves with Noam in toe, and they end up on an adventure that will change their lives forever. When sixteen year old Aaric, fourteen year old Aleena and her husband prince Tolan realise that Quinlan is missing, they leave to find her, taking their fathers ship. On their journey to find their sister they discover a secret that isn’t meant to exist. The writing was flawless and it was like an old fable story come to life. Overall this was a very enjoyable Young adult adventure. It is very well told and I could see everything so clearly in my head, as the author paints such clear pictures. I would recommend this to all age groups of fantasy readers. I can’t wait for the second book in this series. I just loved loved this story. It had me on the edge of my seat the whole way through and I was so disappointed when it was over, Can’t wait to read the second part. The story starts on a farm with Lily and Mel who are twins, only Mel has autism and Lily is her only way to survive. 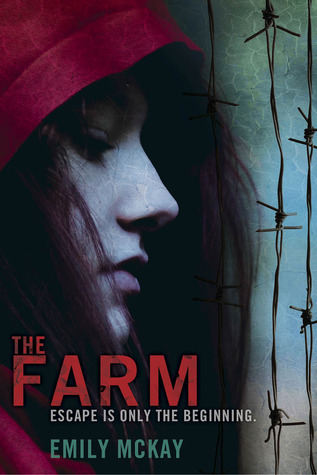 The farm is meant to be a safehaven from the ticks outside the fence, that come out at night to feed but more sinister things are happening inside the farm, it’s a breeding ground and a blood bank for the ticks. When Lily decides to escape taking her sister Mel with her all fails as Carter a guy from the before comes into her life igniting a crush, like wild fire. Carter becomes her protector and helps her off the farm. Lily is suspicious and headstrong at first but soon reasons with Carter and leaves only to realise he didn’t come for her because he likes her, she is humanities only hope for survival and Carter needs her to help with his rebellion. I loved Lily she is intelligent, smart mouthed and would throw down her life for her sister. Her strength and courage throughout the book kept me backingher every decision that she makes even when it’s one of those “don’t go down the dark alley alone” and she does and I rooted for her each time. I loved that I could also read from Mel’s perspective the way she seen everything as music and noise, I really found it fascinating. An amazing story and one I would read again. Review of The Healing heart by Jennifer Howard. The healing heart, what a beautiful and gentle story. The story is told through the eyes of Jamie a young mother of a teenage girl who lost the love of her life Paul (her husband) who adored her, she had a blissful and happy marriage. For two years she has struggled through life without him and raised their only daughter, until she meets Conley a man who she feels a pull towards straight away. The love story that unravels between Conley and Jamie isn’t heart pounding and electrifying. It’s real, with nerves, respect and excitement. It was so beautiful to read and I smiled so much through this book. It’s fresh and a real feel good story. The humour in it also had me laughing from Jamie’s little quirks to Conley’s quick comebacks. All in all if you want to brighten up your day then read the healing heart it will teach you that Lightening can strike twice. Firstly I must note that the cover in no way reflects the actual story, it looks like a children’s book and what a shame, I can only imagine more people pass this book because of its cover I would. But I was asked to review it for my honest opinion and I am glad that I was. The story is told through the eyes of Sara, a young twenty year old med student. She starts by having dreams some just a fantasy about a boy she has never met, but she soon comes to meet him. Some of her dreams are much more gruesome which are actual murders, and sometimes she sees other people’s dreams. But all Sara’s dreams are linked to reality which she soon finds out. Sara is a very likeable character and easy to relate too. This book is far more like a thriller then fantasy and not something I would normally pick up, but I must admit I truly enjoyed it. It was a well thought out book, with a great plot that kept you guessing to the end also this book has a beautiful love story that blossoms throughout it. This is part of a series and one that I will to continue to read. I well written book that I would highly recommend. Firstly I was given this book for an honest review. This is not my usual type of book to read, yes I love fantasy but I am more of a Maria. V Snyder type of girl. The story is told through the eyes of Ifferon who is the last in the bloodline of the god Telm. The God Telm banished the Beast of Agon to the underworld. This leaves Ifferon with one destiny, which is too make sure Agon stays in the underworld, and to help him, Telm leaves him a scroll. Danger lurks around every corner for Ifferon making his journey hard but he meets people along the way that he be-friends that makes it that bit easier. His Journey through the world of Iraldas that the author has created is beautifully done, the description throughout the book has you almost feeling everything, yet at times I did find it was too descriptive for my liking, but in saying that still an amazing story of a world at war and only Ifferon can stop it. Throughout the story there is poetry that the author himself wrote, a sign of a very talented person. It can get a little confusing with all the different names of gods and places, but the story I could still grasp. All in all, I have never read a book like this before, the English in it flows beautifully and has an old tongue to it, the author put a lot of hard work into it, and should be recognized for an amazing first book. I would highly recommend this book. I received this book for an honest review. This story is told through the eyes of Carson a young 18 year old. She lives in a small town in Alice and lives a normal life. Until she finds out she’s from another planet called Emreiana, where she will take the throne and bond with a fellow Gemini in marriage. The story is based on Earth letting us see Carson discover who she really is, and understanding that she must let go of all she loves including her boyfriend Klye, But Aaronmon a protector of the royal family is there to ease her transition. Even though the story is based on earth, it’s still very intriguing we learn all about the new planet Emreiana, they have their own language and are very advanced in technology. Also the people of Emreiana are born with certain gifts that fall’s into four categories. The world of Emreiana sounds so beautiful with its three moons that dictate’s the time of year. The story is very well written and I can’t wait to read the second book, which will be based in Emreiana and we can start to see Carson in her true settings.